The strongest case for the use of nutritional supplements can be made, even to the typically skeptical mainstream medical community, when traditional pharmaceuticals have shown to be of limited efficacy. In such cases, the use of nutraceuticals as both preventive and therapeutic agents becomes very compelling. The need to consider and employ natural bioactive compounds is particularly strong in the field of infectious diseases. Infectious diseases remain a significant public health threat in the U.S. and throughout the world. The Centers for Disease Control and Prevention (CDC) reports that five to 20 percent of U.S. residents get the flu, more than 200,000 are hospitalized and about 36,000 die on average from flu complications every year. This year the ineffectiveness of the flu vaccine was associated with an even more severe flu season. Furthermore, the pandemic threat from mutating influenza viruses such as the H5N1 virus, better known as “avian flu” or “bird flu,” is particularly worrisome given that the virus strain which caused human illness and death in Asia was found to be resistant to two antiviral medications most commonly used to treat influenza infections. Likewise, there is currently no specific treatment for the West Nile virus, although cases were reported in 43 states last year. Another health risk relates to opportunistic and often-drug-resistant infections. Such infections tend to occur at health care facilities and among immunocomprised patients but also occasionally affect healthy patients. (As was the case with “community-associated MRSA” that made the headlines in 2007.) So in this era of continued emergence of new or increasingly common infectious agents, not to mention the increasing threat of bio-terrorism in which infectious agents could be used as weapons, natural compounds that have the potential to modify the body’s response to acute infection must be considered. While there are plenty of nutritional supplements claiming immune boosting properties, very few compounds have undergone rigorous research and rarely are products studied in response to actual infectious diseases. Furthermore, studies on the most popular immune ingredients, such as vitamin C, ginseng or echinacea for the prevention and treatment of the common cold, have produced mixed results. Finally, the mechanism of action of most of the ingredients is still unclear, making it difficult to infer their efficacy for conditions more serious than the common cold. One exceptional ingredient in this respect is AHCC (an acronym for Active Hexose Correlated Compound), a novel bionutraceutical developed in Japan that has been extensively studied and used as a countermeasure to infectious disease. Studies on the effects of AHCC on influenza, avian flu, West Nile virus, MRSA and opportunistic infections make it one of the most researched natural compounds for stimulating the immune response to viruses and infections. Manufactured using a proprietary process that entails enzymatic fermentation of hybridized subspecies of cultivated medicinal mushrooms, AHCC is rich in oligosaccharides (74 percent by dry weight). While most medicinal mushroom extracts tend to contain mostly beta-glucans, AHCC is rich with alpha-glucans (a different type of a complex sugar molecule) which have a low molecular weight of under 5,000 Daltons (as compared to >200,000 for most other well-known immune support ingredients). The body of research supporting the immuno-modulating properties of AHCC is vast and growing. Supported by over 80 studies, AHCC has been extensively studied by researchers at the Harvard Medical School and the affiliated Faulkner Hospital, Yale University School of Medicine, Drexel University Department of Bioscience and Biotechnology, and SUNY Binghamton’s Department of Biological Sciences, among many others. In addition to drawing significant interest in the academic community, AHCC has gained an impressive level of adoption in the medical community. Over 700 hospitals and medical clinics throughout Asia prescribe AHCC to patients as part of an immune enhancement maintenance regimen. Hundreds of doctors throughout the world have also used AHCC as an adjunct alternative therapy for cancer, hepatitis C and other chronic conditions. Consequently, AHCC has become the number one selling specialty immune supplement in Japan and has gained broad acceptance in the U.S., where it is available in most health food stores nationwide. Both human and animal studies have pointed to AHCC’s ability to enhance the activity of natural killer cells (“NK cells”). These cells provide a crucial first defense for the body, launching a rapid attack while the other cells of the immune system are still mobilizing. Researchers believe that although the ability of NK cells to destroy tumors and virus-infected cells is present at birth, NK cells have to be activated. Thus, agents that stimulate NK cell activity might be expected to enhance the control of tumors and virus replication. Activated NK cells are believed to help the body through two modes of action. First, they promptly secrete cytokines— chemical messenger proteins that “awaken the artillery” of the body’s immune system. Second, NK cells secrete substances that directly induce the destruction of tumors and virus-infected cells. It has also been shown in numerous studies that NK cells play a significant role in controlling virus infections, and the correlation between NK cell activity and the frequency of the common cold has been well established. So the clinical evidence that AHCC increases NK cell activity and the fact that NK cell activity helps the immune system fight viral infections suggests that AHCC is a potential agent to boost the NK cell response to viral infections. However, while this inference is compelling, direct research on the effect of AHCC on viral infections is required. And fortunately such research exists. AHCC has been the subject of several studies, which investigated its potential as a countermeasure to various infectious diseases, including the H1N1 influenza (flu) virus, the H5N1 avian influenza (bird flu) virus, West Nile virus, methicillin-resistant Staphylococcus aureus (MRSA) and several other opportunistic infections (Klebsiella pneumoniae, Candida albicans and Pseudomonas aeruginosa). The challenge of researching infectious diseases is there are no ethical, practical or reliable means of evaluating the human response to infectious agents, forcing researchers to rely on animal models. Therefore, the research strategy for AHCC has been to show efficacy in infectious diseases using animal models while conducting human clinical trials to demonstrate its ability to stimulate NK cell activity in immune compromised patients. Two published peer-reviewed human clinical studies (on 269 and 40 subjects respectively) evaluating advanced liver cancer showed extended survival, lower recurrence and improved quality of life among patients taking AHCC. Several other studies demonstrated the ability of AHCC to significantly increase NK cell activity in immune compromised patients. While these clinical studies support the efficacy of AHCC in humans, animal studies have been used to examine whether AHCC can be effective in fighting specific viruses and explore the mechanism or mechanisms for the observed effects. The most recent study published in the prestigious Journal of Nutrition examined the effect of AHCC on the influenza (flu) virus. The research found that mice supplemented with AHCC showed increased survival and maintained body weight during the infection compared to controls (indicative of a less severe infection). Supplementation with AHCC also resulted in enhanced NK cell activity in the lungs and spleen and rapid virus clearance from lungs. So the data clearly suggested that AHCC supplementation enhanced NK cell activity in response to influenza infection, which was associated with a decrease in lung virus titers, a less severe infection and increased survival. Another study looked at the effect of AHCC supplementation against infection with H5N1 avian influenza virus (bird flu). Mice were infected with 100 times the 50 percent lethal dose of the H5N1 influenza virus. The control mice that did not receive AHCC demonstrated 100 percent mortality at 12 days post-infection. In contrast, the group that was fed AHCC prior to infection demonstrated a 30 percent survival through 28 days post-infection. In a second study utilizing the same protocol, the effects of AHCC supplementation alone were compared to H5N1 vaccination (the flu vaccine) alone as well as the combination of AHCC supplementation and the flu vaccine administered together. Vaccination alone resulted in approximately 80 percent survival, while AHCC supplementation combined with vaccination resulted in 100 percent survival. This data suggests while AHCC supplementation alone offers some protection against mortality associated with highly-virulent avian influenza virus infection in mice, supplementation with AHCC may be even more effective as an addition to the flu vaccine. In another study, mice infected with a lethal dose of West Nile virus showed that mice supplemented with AHCC prior to the infection exhibited an increase in survival and a decrease in virus load in the blood at four days post-infection. Looking at “opportunistic” or hospital-acquired infections, the effects of AHCC supplementation on the resistance to Klebsiella pneumoniae (principally associated with bacterial pneumonia and urinary tract infections) was studied in both infected and stressinduced mice. Again, the AHCC-supplemented mice demonstrated increased survival, increased mean time until death, decreased susceptibility to infection and increased bacterial clearance from the blood. Studies on other types of opportunistic infections including methicillinresistant Staphylococcus aureus (MRSA), Candida albicans and Pseudomonas aeruginosa provided similar results: AHCC overwhelmingly increased survival in immune compromised mice in response to infectious challenge. Given the abundance of preliminary positive results across different infections, AHCC supplementation demonstrates valuable and clinically-relevant potential as an immune-enhancing compound. Furthermore, since AHCC supplementation was shown in one study to be even more beneficial when used in conjunction with the flu vaccine, studies are underway to further evaluate the use of AHCC as a preventive during flu season. Finally, AHCC boasts a strong safety profile supported by a Phase I study conducted at Harvard, a 20-year history of use in Japan, its adoption by over 700 clinics and use by an estimated 70,000 people worldwide (including 20,000 in the U.S.). Thus, there is a strong case to be made for adding AHCC to a daily supplement regimen to support the body’s immune system, not only during the apparent times of increased infectious threat such as the flu season, but also all year long. Dr. Fred Pescatore, M.D., MPH, is the Medical Director of Partners in Integrative Medicine and an author of several best-selling books on health and nutrition. Barry Ritz, Ph.D. is the Professor of Bioscience and Biotechnology at Drexel University, whose paper on AHCC and influenza was recently published in the Journal of Nutrition. Olive leaf complex is quite simply one of the most useful natural compounds I’ve ever encountered. It’s a powerful health tonic that’s fantastic for general well-being and enhanced immunity. The olive plant is a rich source of such beneficial plant compounds as tocopherols, flavonoids, anthocyanins, sterols and polyphenols. “The real benefit of olive oil is that it delivers these amazing polyphenols,” says David Rubin, MD, MSc, an Israeli researcher and biochemist. Polyphenols are a group of valuable chemicals found throughout the plant kingdom primarily in berries, walnuts, olives, teas, grapes and other fruits and vegetables. They have a wide variety of health benefits. And the fresh leaves of some olive trees are loaded with them. These polyphenols also have antimicrobial activity against a wide variety of viruses, bacteria, yeasts and fungi. Scientific advances have shown there are at least 30 distinct polyphenols in fresh-picked olive leafs and that the full spectrum of these polyphenols in fresh-picked olive leaves gives a synergistic effect greater than any individual isolated compound alone. This is why the most bioeffective olive leaf products on the market today are always made directly from fresh-picked, whole olive leaves which provide the whole spectrum of natural polyphenolic antioxidants just as nature intended. This also enables them to work together in natural synergy to maximize the health benefits. How is Your Immune System Functioning? Immunity is one of the keys to good health. Think for a moment about the last time something was “going around” your office. Some people got really sick but others probably didn’t. And even among those who did, whatever “bug” was going around probably laid some people out for two weeks while others were back to work after a day or so. The difference? The performance of the Immune System. We can’t do much about the bugs and microbes we’re all exposed to—but what we can do is strengthen and support our immune system. Olive Leaf Complex Can Help. Do you get infections frequently? Do you have frequent colds? Do you get the flu? Do you suffer from bronchitis frequently? Do you have recurrent skin infections? Have you been diagnosed with Epstein-Barr or chronic fatigue syndrome? Do you experience a reduction in stamina and resistance, especially when under stress? Are your energy levels less than you would like them to be? Any or all of these can be symptoms of compromised immunity. What about Olive Leaf for Bacteria and Viruses? Your best defense against the potential damage of bacteria and viruses is to have a strong, robust immune system that will prevent them from taking root and doing harm in the first place. Fresh-picked olive leaf complex can be a powerful weapon in the battle between your immune system and invading microbes. The bitter substances in olive leaves—since identified as the polyphenols we’ve been talking about throughout this article (oleuropein, hydroxytyrosol, caffeic acid, verbascoside, etc.) have been found to be particularly helpful in resisting bacterial damage. In fact, early research by the drug company Upjohn found extracts from olive leaves to be effective in treating infection caused by a large number of viruses as well as bacteria and parasitic protozoans. infected cells and stop viral replication. One brand I particularly like is Barlean’s olive leaf complex. It’s made 100 percent from fresh-picked leaves; it’s never reconstituted, it has no artificial preservatives, no added sugar and it comes in a fast-acting, great-tasting liquid. Every batch has been thoroughly analyzed using High Performance Liquid Chromatography (HPLC), the global standard to scientifically identify and measure the healing compounds in herbal medicines. In Australia, consumers already spend up to three million dollars a month on this incredible olive leaf product. Barlean’s olive leaf complex comes from trees that have been farmed naturally on virgin land in Australia. Organic vermiculture (worm created) fertilizers and pristine irrigation water are coupled with early morning harvesting and immediate transfer of the freshly harvested leaves to the processing plant. Though there is really no “official” recommended dose for taking olive leaf complex, many experts recommend a basic maintenance dose for general use and a “therapeutic” dose for special cases. Generally, the consensus is one tablespoonful (15ml) one to two times a day taken right before eating is ideal for maintenance. For conditions such as the common cold, flu, sinus infections and basic respiratory tract infections, the recommended dose is 2 × 5ml teaspoons every six hours, says naturopath Jack Ritchason, ND. For acute infections such as sore throat, swollen glands or fever, Ritchason recommends three teaspoons (15ml) every six hours. On a personal note, I take a capful of olive leaf complex on a daily basis as a general tonic and immune system booster. Although this is hardly a scientific statement, I can tell you I rarely get sick and on the few occasions I do, it’s very mild and I’m back to my routine in record time. Apparently, I’m not alone in being a fan of olive leaf complex. Experts agree taking this wonderful supplement can be a valuable part of anyone’s health routine. TotalHealth magazine gave out two awards this year at Expo West. The first was to American Biotech Labs LLC for their Silver Biotics product line. Silver Biotics nano silver technology can be found in their skin screams, skin gel, toothpaste, and liquids. Science is their strong suit with over 400 independent third party studies. The staff and testers at TotalHealth have been using the sliver products for over 2 years for an almost impossible list of applications. Here is what we know for sure. 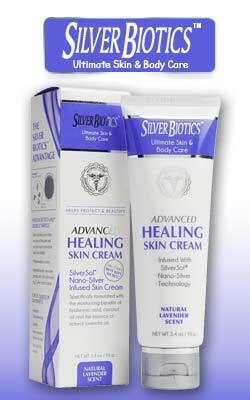 Nothing heals and takes care of skin like Silver Biotics Armor Gel, Silver Biotics Silver Gel and Silver Biotics Hand and Body Lotion and Skin Cream. These products have saved various members of our team from accidents, cuts, burns, sun burns, cold sores, dry and cracking skin, diabetic ulcers, and so much more. ARMOR GEL™ has been evaluated in standard tests that show it can reduce the levels of common microorganisms including Staphylococcus aureus, Pseudomonas aeruginosa, Escherichia coli MRSA and VRE, as well as fungi such as Candida albicans and Aspergillus niger... What else do you need to know? The Silver Biotics liquid, that we didn't even get to in this interview, is a fantastic immune support product especially during flu season. One of our editors gets the occasional eye infection which, if not caught fast enough, often leads to a doctor's visit. Now he just washes his eyes with the Silver Liquid at the early sign of infection and the next morning...no infection, same process with cold sores. There are no side effects when used as directed. It is the one product line that needs to be in every home. Just from a possibility of any kind of infection. Silver Biotics has been used by millions, studied massively, and is the most deserving of our TotalHealth Award of Excellence. Silver Biotics are available on Amazon in the US, Canada, and Mexico. The products can also be found in most Rite Aids in the US if you prefer to touch before you purchase. If you have a Silver Biotics story with pics and/or video contact us. If we publish your story you will receive a gift pack. One of our favorite applications for Silver Biotics Silver Gel is to use it on our hands when we are at busy shows shaking hands. Silver Gel offers hours of protection from constant hand grasping. It's also fantastic for sun burns as we discovered last winter in Costa Rica. See Dr. Sherrill Sellman's interview below to learn a lot more about the benefits of Silver Biotics technology for women's health. It should also be in the kit of every cyclist. If you've ever had road rash you know why you need something that offers strong anti-bacterial and anti-microbial properties to avoid infection. As a cyclist who has recovered from a serious loss of skin from a bike accident using Silver Biotics products I can't say enough positive things about them. Silver Gel and Armor Gel are the best. SilverBiotics™ Silver Gel is formulated using a unique and patented 20 ppm SilverSol® Technology solution. This silver gel is the ideal choice for almost any cosmetic use. With it's powerful 20 ppm SilverSol® gel formula, your skin will immediately benefit from its many unique properties. Not only does it help hydrate and rejuvenate the skin, but more importantly, it helps to promote natural healing. Your skin is exposed to more damage than you may realize, and sadly, much of it is unavoidable. Use SilverBiotics™ Silver Gel everyday to give your skin the upper hand, and join the thousands of individuals who have already come to love the rejuvenating benefits of SilverBiotics™ Silver Gel. The product is currently being used by thousands of men and women to help soothe and renew skin all over the body. It has become a necessary ingredient for daily skin care routines, as it helps naturally make the skin feel noticeably softer. The simple fact that this product works is why it is becoming a top choice in skin care worldwide. Our favorite women's health author Dr. Sherrill Sellman has a lot to say about the tremendous benefits of Silver Biotics Silver Gel and the silver line of products. Silver Biotics Silver Gel is now available in most Rite Aid pharmacies. In August 1928, Scottish scientist Alexander Fleming made a discovery that would change the course of medicine for the better and the worse. Upon entering his lab, he observed a curious thing occurring in a lone petri dish. At the edge of the dish was a colony of mold, and around it, an area that was totally free of any sign of the common staphylococcus bacteria, which was proliferating everywhere else. The cultured mold, Penicillium notatum, would be become known as penicillin. It was officially made available as a miracle treatment in 1941. The promise of penicillin heralded in the age of antibiotics and the successful treatment of potentially life-threatening infections. The prescribing of antibiotics was rapidly embraced with great enthusiasm by the medical profession. Antibiotics became the mainstay in a doctor’s arsenal. However, they were commonly prescribed even when not appropriate. With such widespread and indiscriminate use of antibiotics, it wasn’t very long before antibiotic- resistant strains began to appear. How prophetic were those early warnings! The bacteria, Staphylococcus aureus also known as Staph, was a common bacteria usually residing harmlessly in the noses and on the skin of 30 percent of the population. S. aureus would cause infectious conditions ranging from skin infections, abscesses and boils to potentially life-threatening systemic infections. The more antibiotics were incorporated into medicine’s arsenal against infection, the more rapidly the bacteria would develop resistance. To overcome resistant strains, even more varieties of antibiotics had to be developed. But S.aureus would quickly out maneuver each new version of the drug. One such powerful antibiotic was called methicillin. But within just one year, strains of MRSA (Methicillinresistant Staphylococcus aureus) began spreading in hospital wards around the world. It was apparent that MRSA was immune to all but a very few of the most potent antibiotic treatments. Recognized as the cause of a serious pandemic facing the world today. It is estimated that as many as 52 million people worldwide could be carrying MRSA. Scientists report that antibiotic resistance to S. aureus has gone global. It has been reported in Europe, North and South America, North Africa, the Middle East, East Asia and the South Pacific. Antibiotic-resistant pathogens, such as MRSA, have now become impervious to all but a mere handful of antibiotics. The current treatments for MRSA include Vancomycin and Teicoplanin. Since these drugs are poorly absorbed orally, they must be administered intravenously. Vancomycin is not only toxic to the kidneys but also very expensive with a course of treatment costing about $1800. What is even more worrying, Vancomycin-resistant strains of bacteria known as VRE (Vancomycin-Resistant Enterococcus) have already been discovered. MRSA is the most common cause of skin and soft tissue infections. While it may initially appear as minor pimples, boils or abscesses, it may progress to severe infections involving muscle, bone, lungs or heart. It can also cause more chronic conditions such as pneumonia and endocarditis. Wherever there is an open wound, there is the risk that MRSA could develop. Initially, MRSA was considered a hospital-acquired infection occurring almost entirely in hospitals amongst patients already immune-compromised. But then a more virulent strain was discovered in the general population, affecting seemingly healthy people. MRSA in the community is very different from the MRSA found in hospitals. It seems to have developed quite separately, and has several unique qualities—most notably that it causes infections in previously healthy individuals who don’t have the risk factors found in hospitalized patients. MRSA is now found throughout the community. People have been diagnosed with MRSA in the military, in school dorms, in prison and in sports, especially contact sports. Poor hygiene, unsanitary conditions, bodily contact and contaminated locker rooms are ways that MRSA is transmitted. It is believed that MRSA is present in the nose and skin of about one-third of the general population. In an alarming CDC-led report, researchers found that MRSA is making its biggest gains among children. Not only did the study document a 10 percent-a-year rise in MRSA in kids from 2005–2010, it also found the proportion of those cases involving community-associated MRSA jumped 55 percent. Recent studies have shown a significant rise in the number of youngsters who are carriers of MRSA. A 2010 study published in Pediatrics found that the number of children hospitalized for MRSA infections increased from two in 1,000 admissions in 1999 to 21 in 1,000 admissions by 2008. The cause appears to be the never-ending and growing use of antibiotics in people and animals. The more antibiotics are liberally used, the more antibiotic-resistant organisms such as MRSA are sure to follow. The statistics are revealing a worrying trend. The number of people infected with MRSA is estimated to be 880,000, with 460,000 people hospitalized with a MRSA diagnosis. It is estimated that 20,000 to 40,000 deaths are attributed to MRSA every year. With MRSA on the rise and so few effective antibiotic options left, health officials are understandably very concerned. In the past antibiotics were believed to be the solution to serious infections such as MRSA. Now they are recognized as the cause. We can no longer rely on antibiotics as the solution for dangerous antibiotic-resistant bacteria and other serious pathogens. The solution for the MRSA epidemic must be found elsewhere. How were infections treated before the advent of antibiotics? Dating back thousands of years, there was one healing approach that had been extensively and successfully used by the Egyptian, Greek, Roman, Phoenician, Macedonian and Chinese civilizations. This powerful healing medicine was silver. Hippocrates, the “father of medicine,” wrote in his medical texts that silver had beneficial healing and anti-disease properties. He praised silver for its tissue repair and wound healing abilities. Ancient peoples also learned that silver bestowed powerful anti-microbial effects, as well. For centuries silver’s powerful healing properties for both external and internal medical conditions was widely known. It is irrefutable that it was one of the most effective, yet totally safe, antibiotics known to man. In 1914 the medical journal, Lancet reported phenomenal results from using silver, stating it was absolutely harmless, non-toxic to humans, and highly germicidal. In fact, colloidal silver has proven itself useful against all species of fungi, parasites, bacteria, protozoa, and certain viruses. The knowledge of silver’s profound healing attributes continued into more modern times. The use of silver in its colloidal form, a liquid suspension of microscopic particles of silver, was the principal antibiotic treatment prescribed by thousands of American medical doctors prior to 1938. With the advent of antibiotics, the popularity of silver rapidly declined and totally lost favor in modern medicine. However, with the emergence of life-threatening antibiotic-resistant strains such a MRSA, silver is once again coming to the rescue. It is nature’s true antibiotic, eliminating bacterial infections but without the devastating effect of causing resistant pathogens. What is even more phenomenal, silver can also kill virtually all forms of viruses, fungi and molds safely without any side effects. Thanks to an advanced 21st century technology, a new powerful form of silver has been developed as an alternative to topical antibiotics for preventing MRSA and other infections This new technology is called SilverSol Technology® developed by American Biotech Labs. The term “sol” is a chemical designation of a pure mineral permanently suspended is water where the mineral’s charge is transferred to the entire body of water. All other silver products work by chemical action, requiring direct contact with microbes to have any positive effect. SilverSol Technology® utilizes a catalytic action as well, not just a chemical action. The catalytic conversion allows the SilverSol® particles to first destroy pathogens, and then to instantaneously recharge and “kill” again and again—like a rapid-fire machine gun. The result is that SilverSol® is an incredibly powerful, yet totally safe and non-toxic form of silver, destroying thousands of times more pathogens than a simple colloid or ionic silver. This explains why other silver solutions and suspensions contain up to 300,000 ppm (parts per million) of silver, but SilverSol® works just as effectively, if not more so, at only 10 to 24 ppm. SilverSol® is available as a topical OTC wound dressing gel sold under different names in different markets. ASAP OTC™, which is the first of the SilverSol® OTC gels, is the preferred wound management product of doctors and moms alike. In the sports channels, you will find it known as Armor Gel™, which was designed specifically for athletes and everything their lifestyle entails. American Biotech Labs also developed a version specifically for animals called ASAP Pet Shield® which is used confidently by vets and owners to help protect our furry family members. First, when applied on a wound, these OTC gels quickly and efficiently reduce the levels of pathogenic bacteria they come in contact with in just minutes, including the deadly MRSA. They then form an invisible barrier over the wound that prevents further infection. They accomplish all of this while leaving beneficial bacteria unscathed. These topical gels also wield the same powerful anti-pathogenic ability with molds and fungi, such as Candida albicans. The good news is that safety studies have shown they do not interact negatively with pharmaceuticals; in fact, they have been found to work synergistically with some medications. The ASAP OTC™, Armor Gel™, and ASAP Pet Shield® provide a safe, microbe-reducing barrier for wounds that protects them from infection. This allows the body to repair itself unimpeded, which could result in faster healing. They do this while offering more broad-spectrum anti-microbial benefits than the traditional topical prescription antibiotics and antifungal preparations without creating more resistant bacteria strains! These OTC gels utilize ABL’s innovative SilverSol Technology®, which has garnered multiple patents in the U.S. and dozens of countries throughout the world, including a broad-use patent that provides the company with exclusive rights to use its silver-based products to combat many of the world’s most destructive pathogens. American Biotech Labs is always moving forward with new and innovative ways to utilize the safe and potent benefits of SilverSol Technology®. They are in the final stages of developing a new antimicrobial skin and wound wash that will revolutionize the hygiene and health care industries. The epidemic of powerful antibiotic-resistant pathogens such as MRSA was created by the ignorant and arrogant use of antibiotics. The hope that antibiotics would be the “Magic Bullet” has now been acknowledged as a major medical mistake. Fortunately there is a solution. The proven efficacy of ASAP OTC™, Armor Gel™, and ASAP Pet Shield® offer the certainty of a powerful, affordable and safe protection against pathogens. Once again, Nature combined with modern science has provided all the answers for our health and wellbeing.